Expecting rain the next day, I decided to push ahead with getting the lantern head installed. I still had not found the box of assorted wedges and pins that I had made, so I went to the shop and fabricated some new ones, using some Ipé and Jatoba scraps I had kicking around. I keep skinny little offcuts for pins and wedges in a box on a shelf. I brought along a Lie Nielsen skew rebate plane, which, with a fence fitted, works like a little jointer. The two vertical pieces you see sticking up are lignum vitae hammer-head locking pins which are buried 8″ down into the post. There are empty slots in the middle of each sill you can see above. These were fitted with wedging pins which drop down into the pocket and then slide sideways to tighten. I forgot to take pictures of this step. In the above photo you can also see the two wires for the light being snaked up through one of the posts. I then discovered that some more bits were missing, pieces involved in framing the sole removable window panel. I could proceed no further with assembly until these were in place. So, back I drove to my shop (half an hour away), intent on fabricating some new ones. These pieces were rebated and had compound angle cuts on their ends, so it was looking like an hour or two of work lay ahead. As I got to the shop I realized the first order of business would be to root through that box of skinny pin stock to hopefully find some more mahogany for these pieces. I also had a slight hunch that maybe I should empty the box out…and that is when I found all the missing wedging pins and window framing bits. Whew! That saved me a bunch of work. I did plane some more pin stock, and after a 15 minute stopover in the shop, I headed back home. 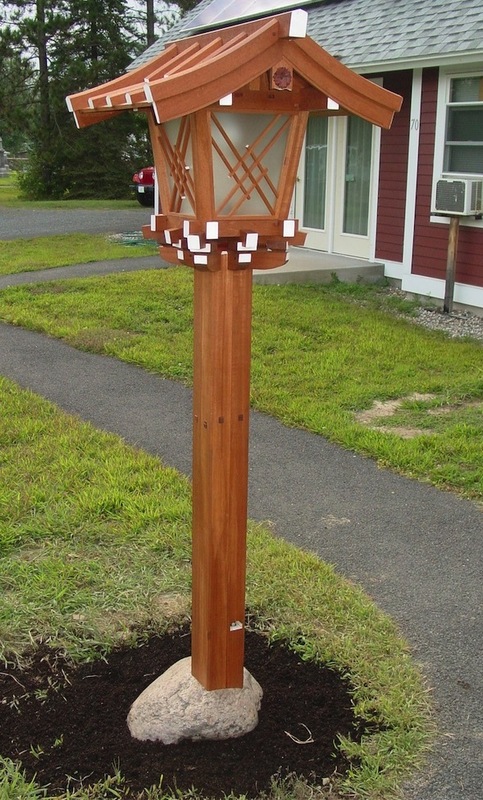 The mahogany is so stable that even after this lantern has sat for several years, everything still fit without requiring adjustment. There were a few new pins required here and there, but then again keep in mind I used to demonstrate Japanese carpentry during library talks and this lantern has been apart and together again 15~20 times. That’s not a normal condition for joined woodwork. So, grain does inevitably compress and take a set through so many assembly/dis-assembly cycles, which necessitates slightly fatter pins be fitted here and there to take up the grain compression sloppiness, which is on the order of 1/100″ or less. There is one corner pin visible when has not been tapped all the way in yet – I’ll have to go and check to see if I have done that or not. That was a moment of some satisfaction! Cue in the drum beat soundtrack from Kubrick’s 2001 A Space Odyssey…. I need to work a bit on the landscaping yet, but all those things will be done in good time. 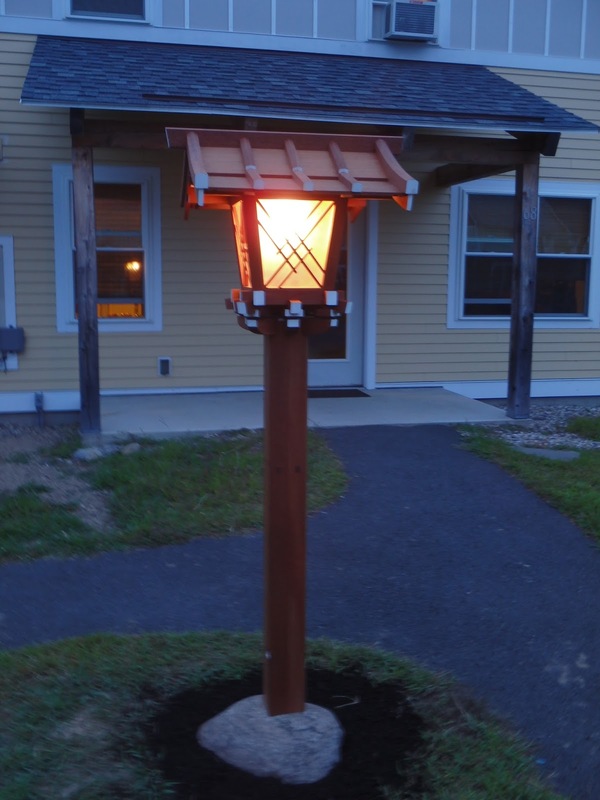 The lantern install has now increased my desire to bring the landscaping along a bit further. 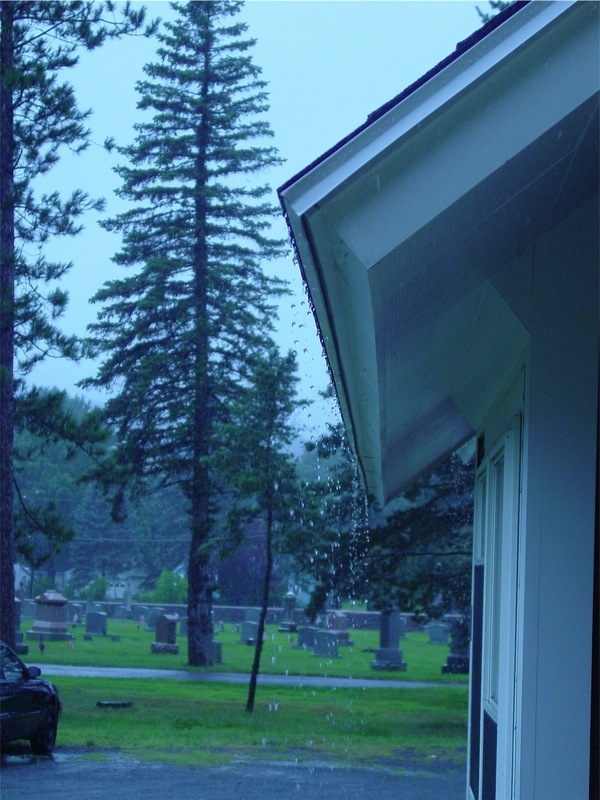 I have a plan to put a weeping Mulberry in the vicinity of the lantern, probably next spring. In the next day or two I will plant some ground cover at the base. Better the lantern be used and enjoyed, though in an environment which degrades it, than to have it sitting in my shop under a blanket, as it has done for the past 3 years or so. Thanks for coming by the Carpentry Way. Final post follows. Looks fantastic Chris! Have the neighbors asked for one for themselves yet? thanks! Glad you liked it, and comment appreciated. thanks for the comment and no, a birdhouse is not envisioned at this point. I do wonder if birds, bees, or wasps might look for a home in the lantern at some point though. good to hear from you! My neighbors have ventured positive comments so far, however none have asked me to make one. Still as beautiful as ever! !KEEP UP THE GOOD WORK! !Is there any chance if someone wanted to build it would you consider selling a copy of the blueprints? ?Love to try! ?Still great workmanship and detail!! I appreciate your positive comments. Sorry, I don't sell plans or blueprints. 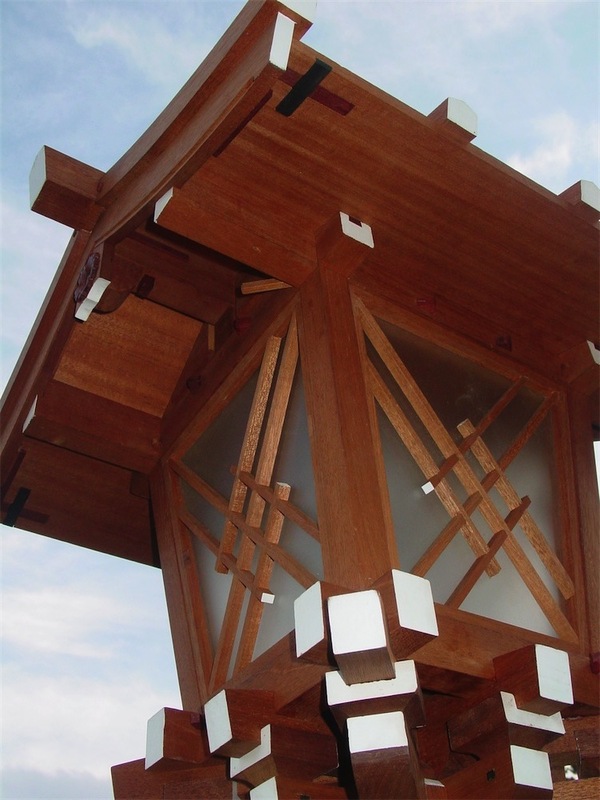 When you are ready to make something like the lantern, you will know how to design it. Lovely work mate! I think it would taken a certain type of person to fully appreciate a lantern like this and the price that it should command. Is this real mahogany or the African stuff? thanks for your comment. It's a rough piece of work but it is standing for the time being. It's Honduran Mahogany, not khaya. 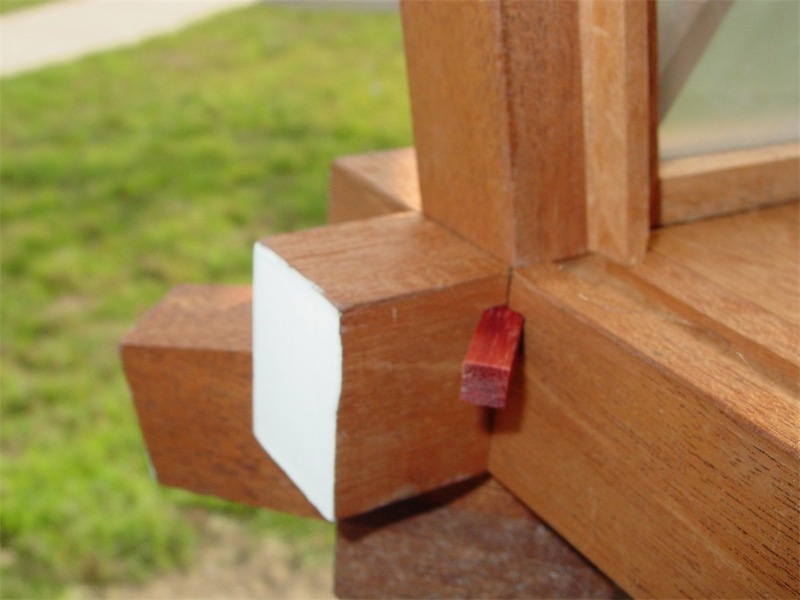 Many of the pegs are bloodwood, and there's a spot of lignum vitae here and there. Thanx for keeping me grounded! It will give me a place to thrive for!Keep up excellent blog!!! I've worked with khaya and it's rather nasty stuff. I might try the proper stuff on a bird house at some point. I spent some time last winter playing around with the problem of building a small, water tight box. The challenge was something I could leave a box of matches in, for a month in January and have them stay dry. I ended up with a very simple box made of salvaged redwood, built along the lines of a NW tribal tackle box. It kept the matches dry, but I still haven't figured out a clever way to latch it…something with cord. 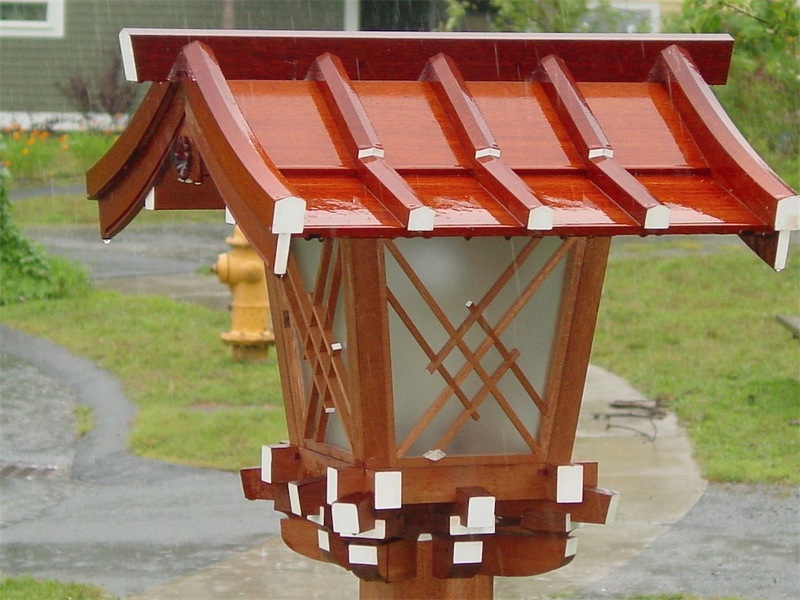 Your lantern reminds me of the water tight box problem. 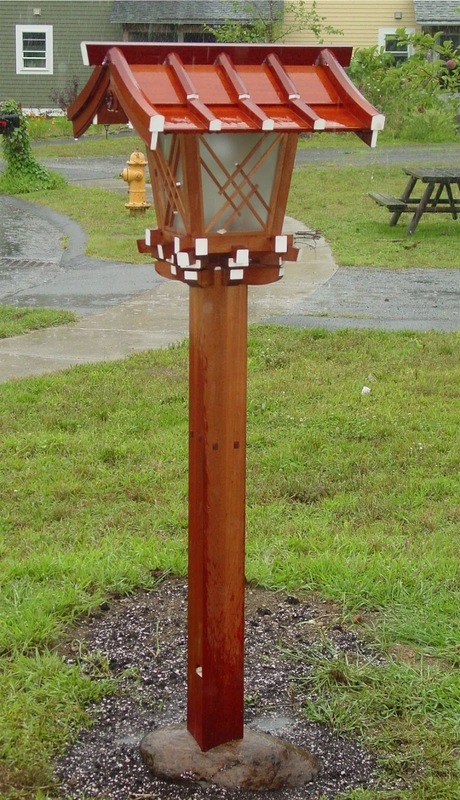 Of course the coastal NW natives never made lanterns on a post…but it would be interesting to see how they solved the problem. Could you tell me what the aprox. overall dimensions are? Wow! I think it is an amazing piece. I've made waterstone ponds before using joinery and they were quite watertight. 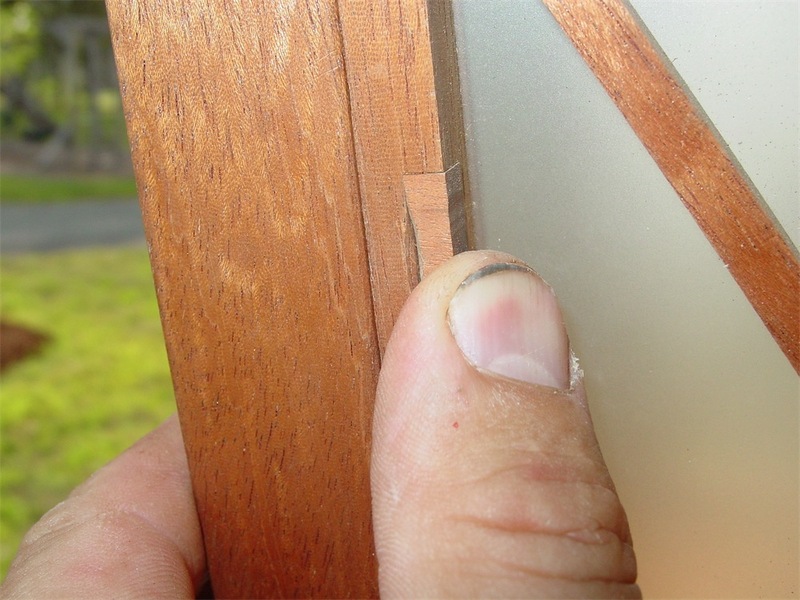 If the joinery is tight, then humidity will swell things shut in most cases. glad you liked it – thanks for the comment! so glad you have set it free and can fully enjoy it now…it is beautiful, おめでとう! thanks – I appreciate your comment!